3) Several Chinese goats were shorn to provide hair for the mix. 4) Lime plaster is very very heavy. I may mock my lovely sister here on the blog, but I now have the muscles of an Olympic weightlifter. 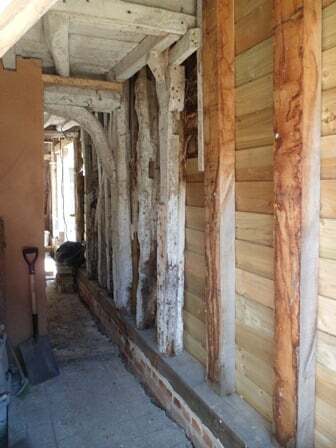 There is obviously a lot more to know about lime plaster and we were lucky enough to have the wonderful Roy Cafferty running the lime plaster course. What Roy does not know about lime is not worth knowing and he is an incredible craftsman. Thank you to Roy and once again Katie Seabright from Essex CC Heritage team for an excellent course. And to all the participants who worked very hard and lathed and plastered up a storm. The majority of panels were covered in only two days, and as you will see, the Mill House is looking rather spectacular. We're currently finishing the last few panels, and then have 2 - 3 weeks grace (with some care) until we start on the top coat. Best of all, restore a couple of doors and the windows*, and hey presto, Humbug and I have a new hiding place. Thanks once again to everyone on the course. It was lovely to see familiar faces from last year's Managing a Masterpiece timber frame course. I do not think we could have asked for a more enthusiastic group of pro-lathers! 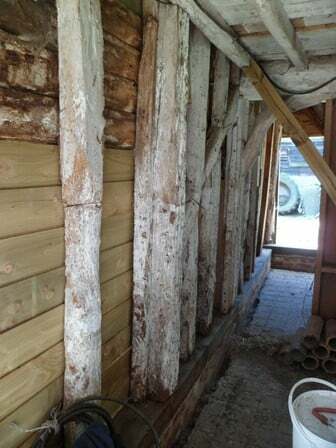 If you missed this course and are interested in learning about traditional building techniques and materials, information on future seminars, lectures and hands-on courses can be found in the Essex CC Traditional Building Courses booklet.